I generally don't know my hydrangia from my hyacinth. I see a pretty flower, take a picture of it, and the story usually ends there. But some people can look at a flower and rattle off multiple syllables in Latin, so I got curious. 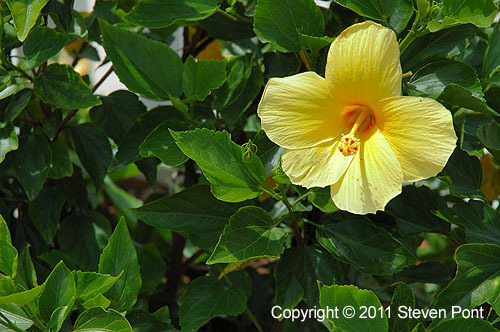 It only took me about twenty minutes of surfing the Internets to find out that this flower is a Hibiscus. This discovery was not accompanied by any great feeling of accomplishment, so my next flower picture will be described as "pretty [insert color here] flower".